Another wonderful meal at the McGary cafe! Do you like clams? I do. While Baby Lady loves her mussels, I absolutely adore clams. 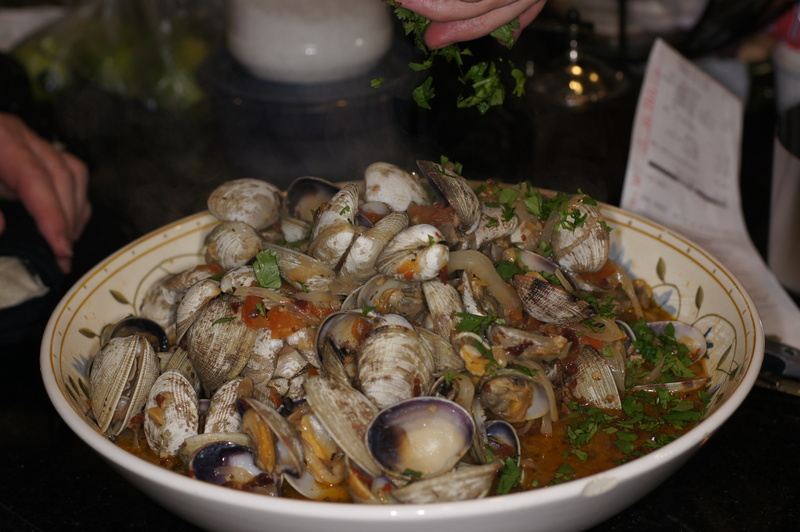 This is a wonderful way to cook clams and is guaranteed not to disappoint. Give it a try sometime. Clams are one of my favorite dishes. I love clam chowder (both Manhattan style and New England style). Fried belly clams send me to Nirvana. I love all kinds of clam dishes from clams casino to spaghetti alle vongole to kam heong clams (Malaysian golden fragrant clams) to hoy lai ped (spicy clams in Thai roasted chili paste) to clams in ginger sauce, and beer steamed clams, etc., etc., etc. I really cannot get enough of them. They are such a wonderful food and there are multiple varieties of clams. 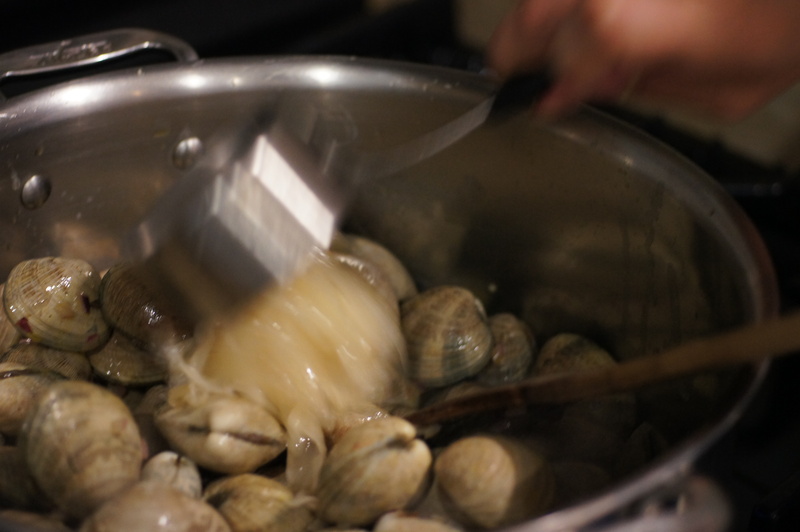 New England steamer clams are called a soft shell clam. Unlike hard shell clams, steamers have rather thin, brittle shells. Also, the shell doesn’t close completely because the clam is too large to fit inside it. Instead, protruding from the shell is a long foot, or siphon that the clam uses to filter the sea water and feed. While hard shell clams live near the surface of the sea floor, steamers bury themselves more deeply, and extend their long siphons to the sea floor surface. 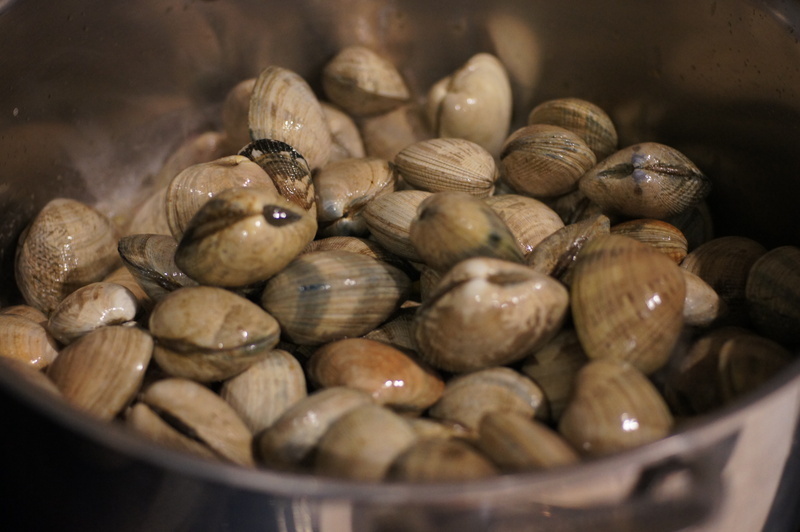 Hard shell clams include quahogs clams, cherrystone clams, littleneck clams, manilla clams, razor clams, and geoduck clams, to name a few. Generally speaking, the smaller the clam the younger it is and the sweeter it will taste. 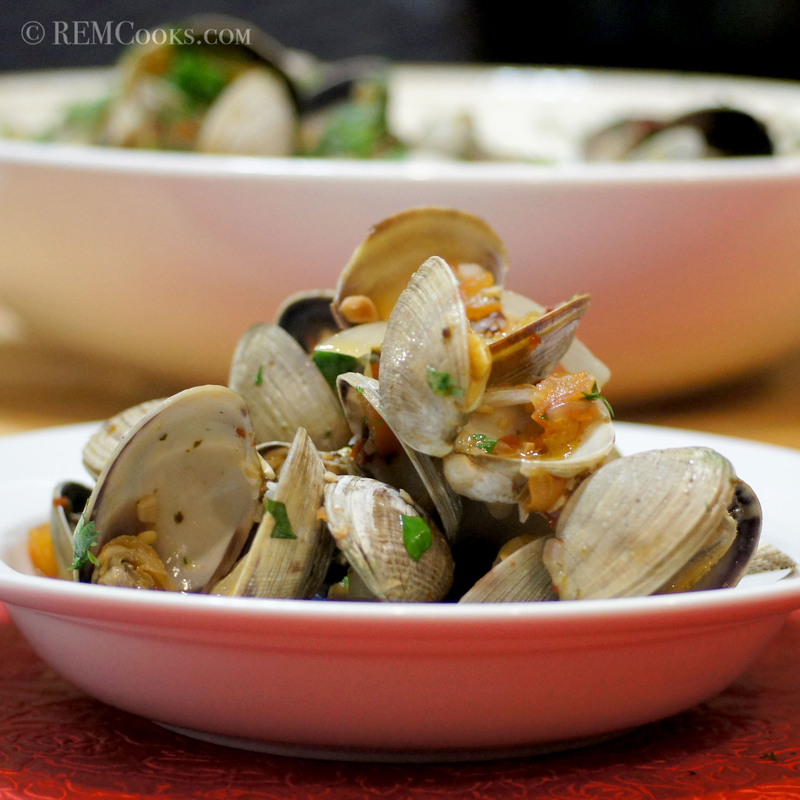 I just love clams and, as shown above, there are so many different ways to prepare them. In a prior post, Tacos de Pescado al Mojo de Ajo (Fish Tacos with Garlic Salsa) we showed the beauty of Mexican style garlic salsa Mojo de Ajo. It is just flat out fabulous. It keeps well in the fridge and even freezes well if you made too much, something that is hard to do because you will find ways to use it. It is unbelievably versatile and pairs well with almost any protein you can think of. We like it so much we always make a double batch and keep it on hand. This recipe came about because of needing to make some mojo de ajo and a desire to have some clams for dinner. Two delicious and versatile ingredients came together to make an unbelievably delicious meal! If you already have the mojo de ajo on hand, this is an incredibly quick and easy meal to prepare. If not, it’s a great weekend meal! We hope you like it as much as we did. 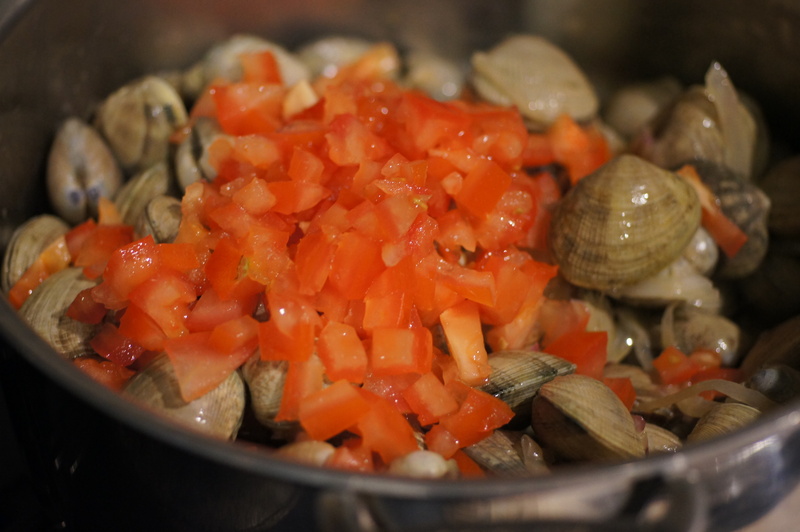 Clams, like mussels, cook very quickly. So, make sure you have all ingredients prepped and ready to go. 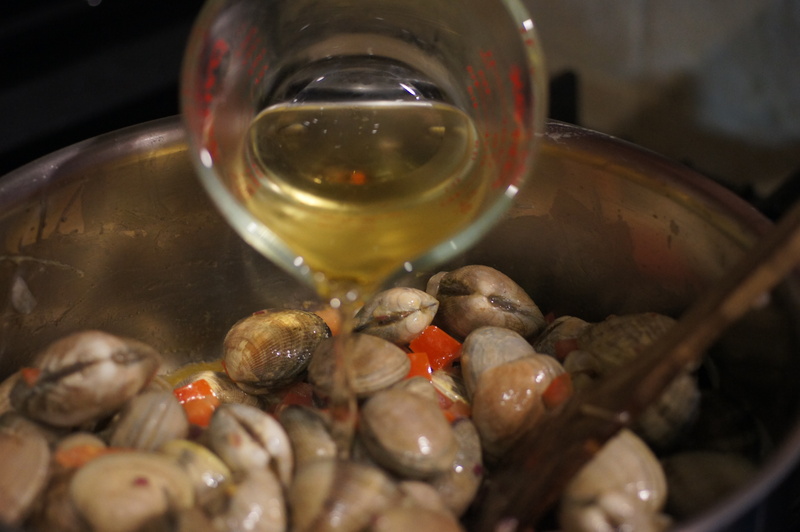 Once you start cooking the clams it will be time to rock and roll because things are going to move very fast. 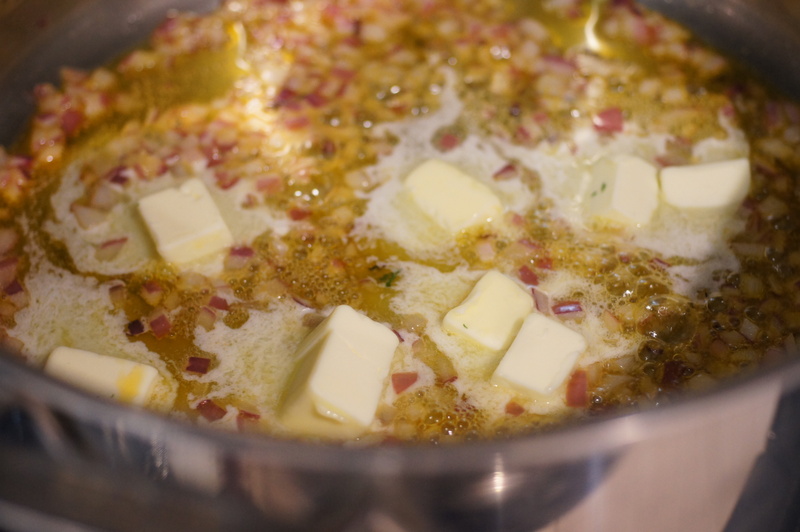 To start, add oil from mojo de ajo, butter and shallots to a large skillet or pot. Sauté over medium heat for 1 minute. Stir to incorporate the ingredients. 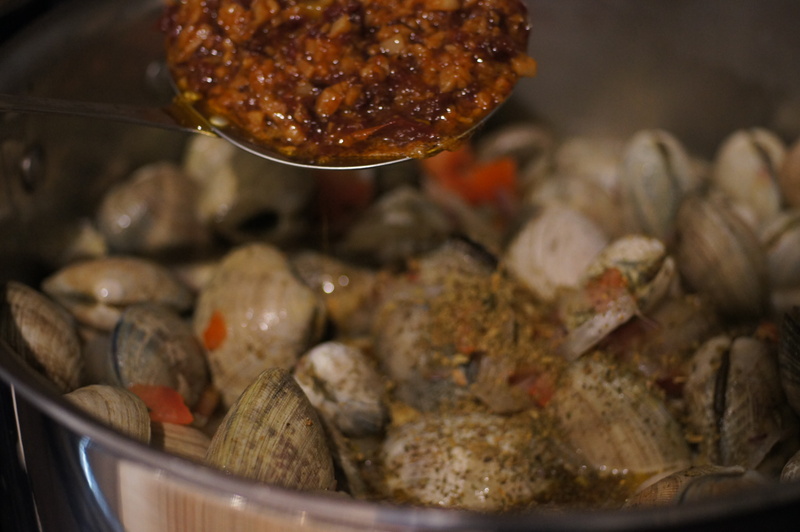 Increase heat to high, cover and allow clams to steam 3 – 4 minutes or until they open. When done, remove from heat and pour into a large serving vessel. Here in the Lowcountry we actually have nice local clams and if one knows of a good spot and invites a friend, you can get quite a haul in an hour or so. I’ll be making this recipe during the holidays! Thank you. You are very welcome. 🙂 I would love to be able to dig for clams. Living inland, however, is not conducive to such activities. Hence, I have to make do with the local Asian markets. They keep a very nice supply of live mussels on hand, including geoducks. Your remark had me googling exactly what kind of clam we have here in SC. And it is the hard clam, Mercenaria mercenaria – northern quahog in all sizes, apparently. They are not as popular with the locals here as oysters, blue crab or shrimp so a lot of the harvest is shipped out of state. Learn something new everyday! 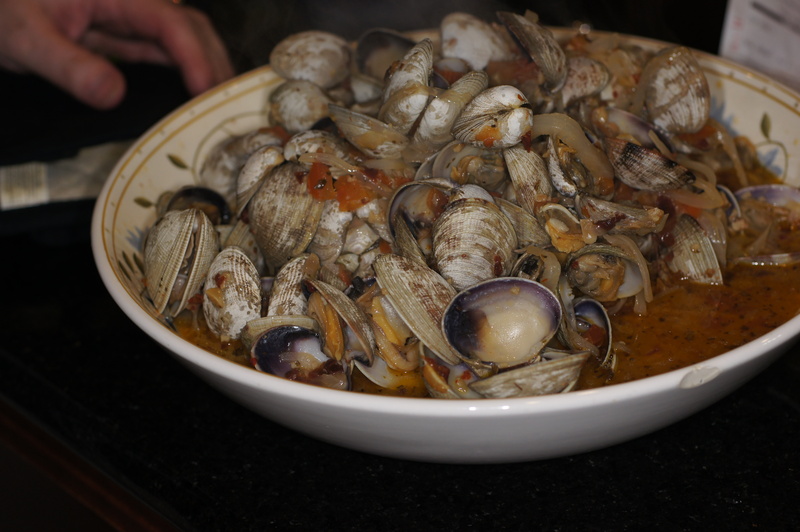 My mom’s from New England, and whenever we would visit her hometown, we would make a meal of steamers. Now you’ve got me reminiscing about childhood and missing clams – I haven’t had them in years. This preparation sounds fantastic! Being stuck behind a row of mountains in the middle of prairie flatlands.. our access to great clams is pretty minimal. Your Baby Lady is a lucky gal, I can just imagine how wonderful it would be to sit down to a glass of wine and a bowl of these! Wow. I’m surprised because you would think that in a city as large as Calgary and with its diversity, you would be able to have clams, among other things, flown in. Although DFW is only 300 miles from the Gulf Coast, none of the clams in the various markets come from the Gulf but are flown in. Have you tried any of the Asian markets in Calgary. If there are clams, they will either have them or know where you can buy them. We have access to clams, but they never seem to taste the same. When we’re in British Columbia, the seafood there is much better! I love clams, too, and this must be delicious. Thanks, Stefan. I was really good. 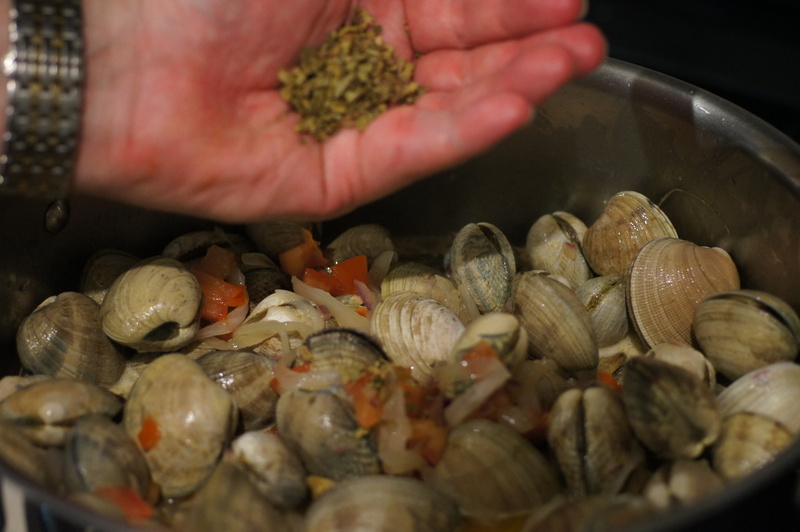 The mojo de ago is unbelievably good and works very well with clams. The resulting broth was amazing. I kept what was left and will use it in a seafood chowder/soup in the future. We ate everything our little bellies (which grew larger after that meal) could handle. The 2 of us ate 4 lbs of clams plus bread! I was stuffed to the max, as was the Baby Lady. Another cracker. They look excellent. I had some beautiful clams while in France last week. cooked in a half glass of white wine with chilli, parsley and garlic. Served with spagetti. Awesome. Hi, Conor. Thanks for your nice compliment. Glad you had a good trip to France. I hope it was a productive one. We love clams done simply like you had in France. The clams truly are the star and it’s one of my favorite preparations of clams. This one, however, the clams had to share the spotlight and it was wonderful. You really need to give these a try. There is very little heat from the chiles but the sweet, smokey flavor of the garlic salsa beautifully compliments the clams. You have talked me into it!